Slender, medium-sized wheatear. Male of race xanthoprymna (E Turkey, NW Iran) has black throat, sides of head and neck merging with blackish brown leading wing-coverts, rufous rump but white sides to tail; black band at tip of tail narrow (larger male Red-rumped almost black-tailed); little white in wings. Female usually lacks black throat but rump and tail as male. 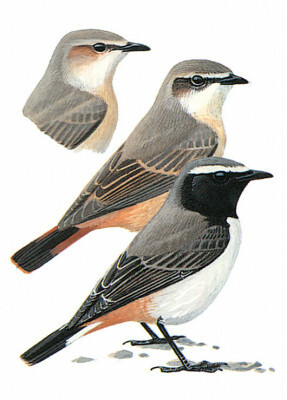 Race chrysopygia (Iran except NW; sexes alike) lacks black throat in both sexes; upperparts drab greyish with orangey-rufous rump and sides of tail (rump sometimes paler); underwing pale. Intermediates occur: black-throated birds with orange tail-sides; also chrysopygia-like birds with white tail-sides. Absence of ginger tinge to head, lack of buffish wing-panel, less black in tail and size separate birds with orange tail-sides from female Red-rumped. Usually solitary; has bounding hops and slight downward tail-flicks; often flies with tail closed.